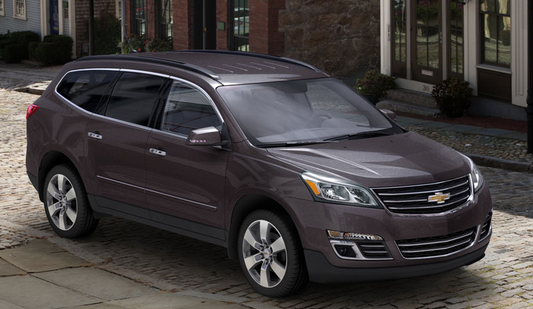 The Chevrolet Traverse is just one vehicle included in General Motors’ newest recalls. General Motors Co announced three new recalls affecting 1.5 million vehicles for airbag deployment and other issues. The announcement comes on the same day it was revealed that the company faces its first class action lawsuit tied to February’s massive recall of vehicles for ignition problems. The company will also take a $300 million charge against earnings to pay for repairs as part of an initiative to be more responsive to problems with its vehicles. The Detroit automaker announced three recalls on Monday totaling more than 1.5 million crossover sports utility vehicles, full-size vans and luxury vehicles. Nearly 1.18 million crossover sports utility vehicles have been recalled for an issue with wiring under the driver’s seat that can crimp and cause a “service air bag” warning light to trigger on the dash. Impacted models include some 2008-2009 and all 2010-2013 Buick Enclave and GMC Acadia crossovers, as well as all 2010-2013 Chevrolet Traverse and some 2008-2009 and all 2010 Saturn Outlooks, according a National Highway Traffic Safety Administration recall report. The company reports that the issue could lead to the nondeployment of side airbags. Dealers will repair the wiring harness of seat mounted airbags. Additionally, the automaker is recalling 303,000 model year 2009 to 2014 Chevrolet Express and GMC Savana full-size vans to replace plastic material in the passenger instrument panel to meet federal head impact crash standards for unbelted passengers. The final recall affects 63,900 Cadillac XTS sedans from the 2013 and 2014 model years for a corrosion problem in the brake booster electronics that could cause an engine compartment fire. Dealers will apply sealant to the connector cavity plugs, re-route the vacuum pump vent hose and replace the front body wiring harnesses as needed. The company says it is aware of two engine compartment fires in unsold vehicles at dealerships and two cases of melted components. GM reports it has not received reports of accidents or injuries related to the new recalls. Reuters reports the new recalls resulted from General Motors Chief Executive Mary Barra’s push for a comprehensive internal safety review following the ignition-switch recall last month. That recall affected 1.18 million compact cars and has been tied to between 12 and 300 deaths. Earlier Monday, it was announced that the company faces what is believed to be the first suit against related to the February recall. General Motors and the NHTSA have come under fire for not recalling the compact vehicles sooner after it was revealed that GM knew about possible ignition issues as early as 2001 and received numerous complaints from customers and dealerships.